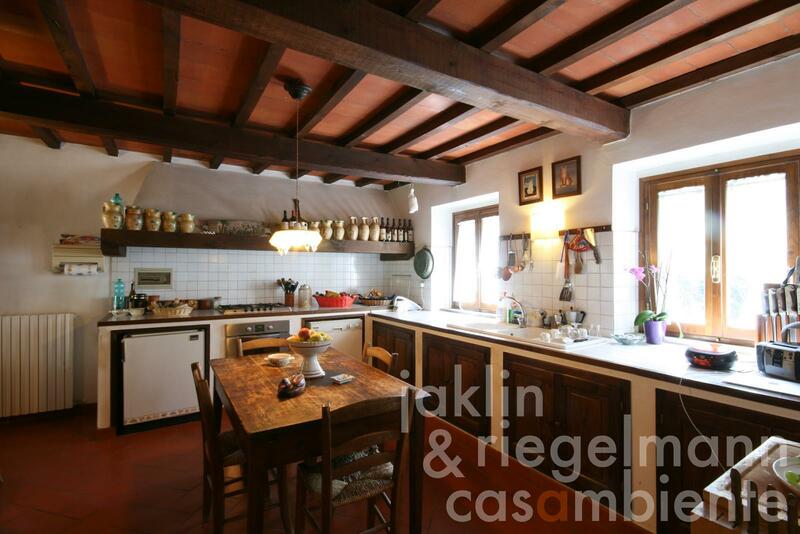 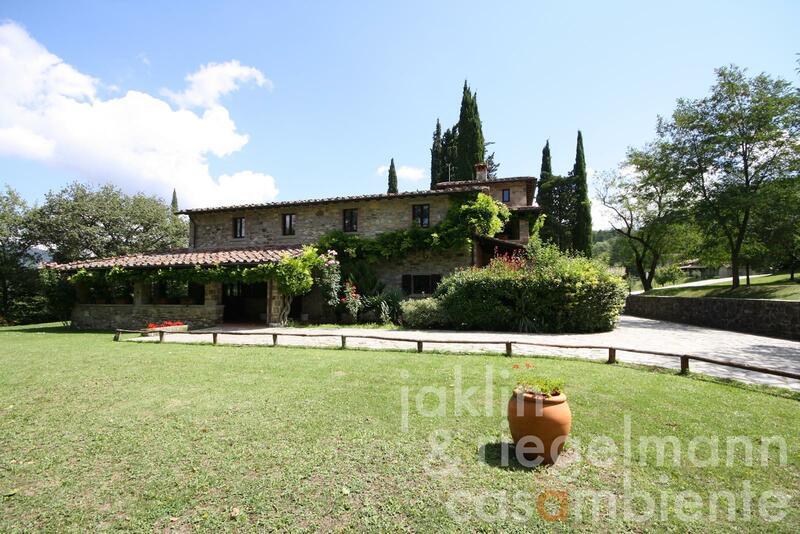 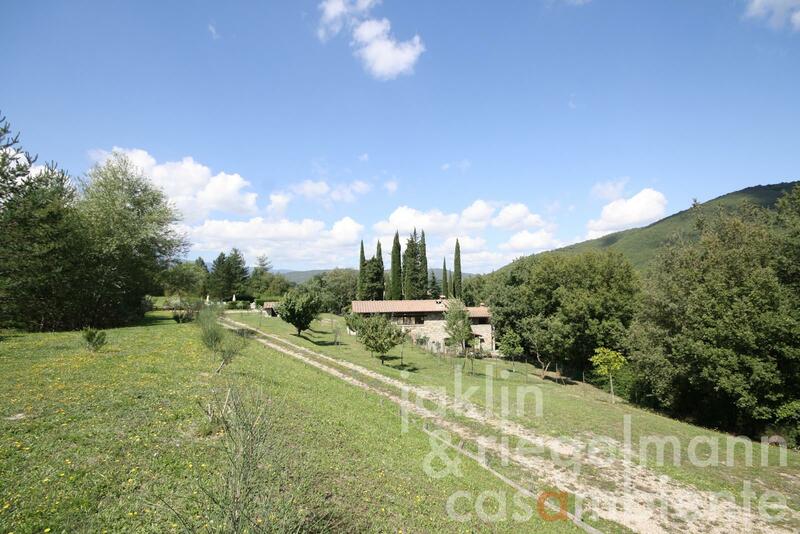 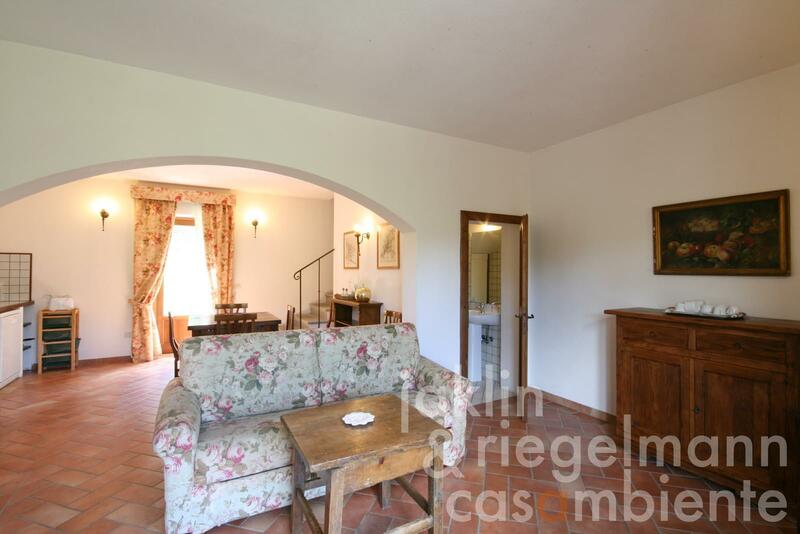 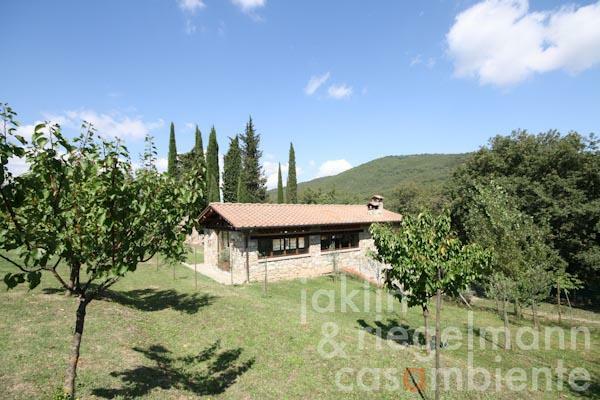 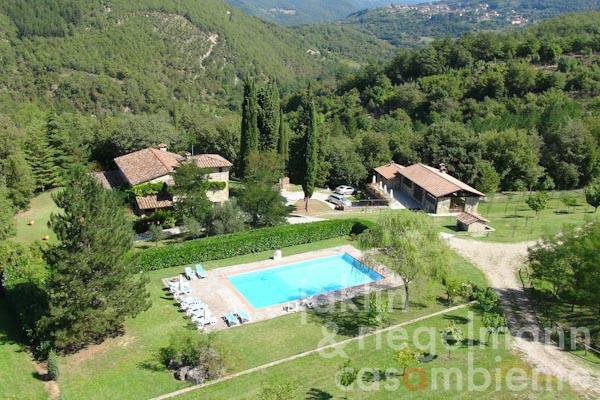 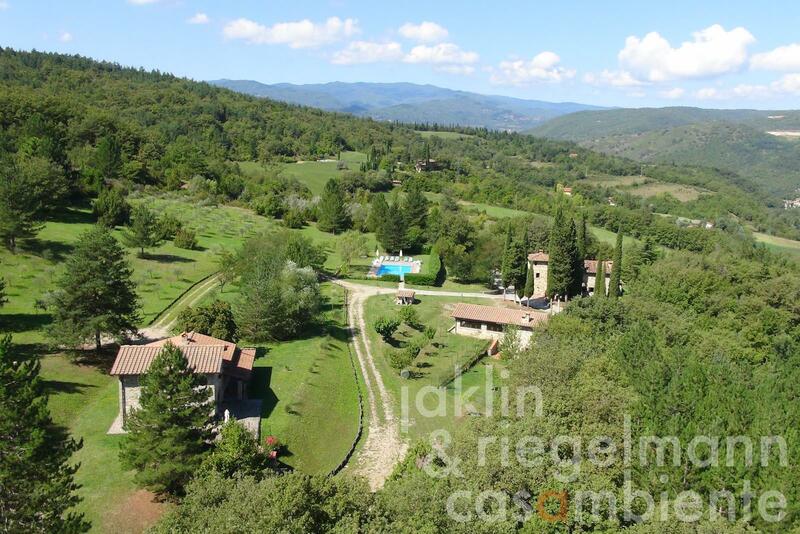 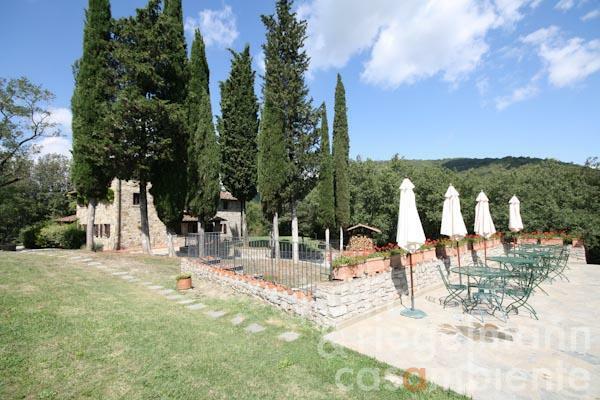 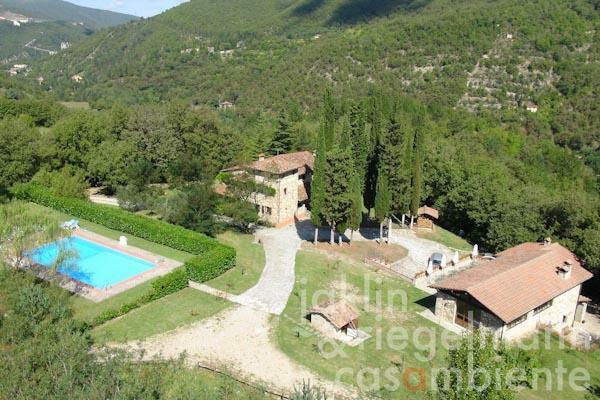 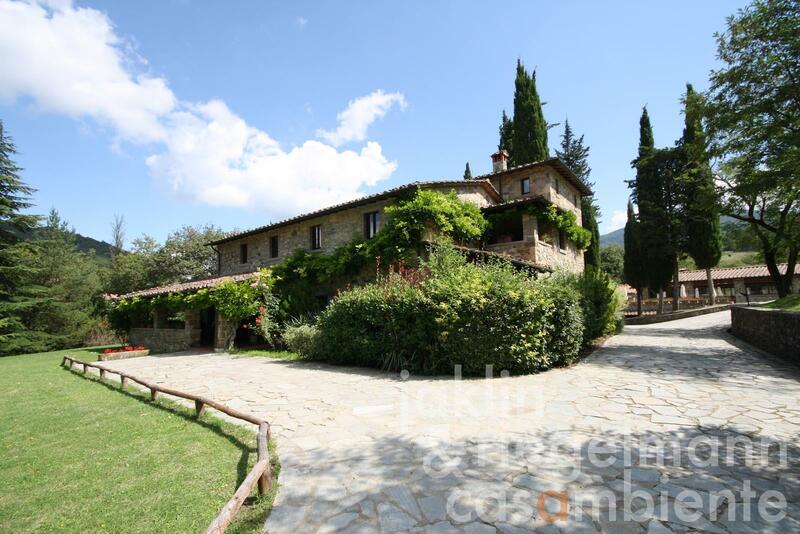 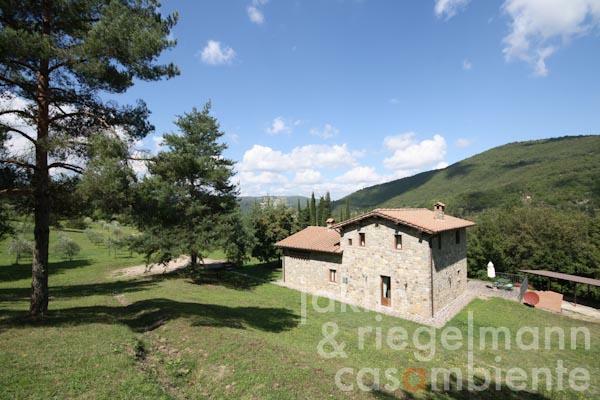 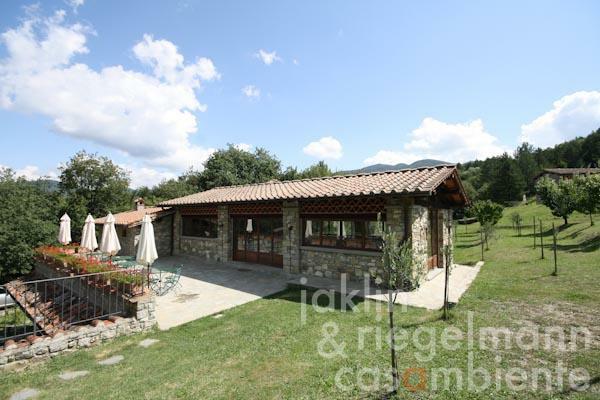 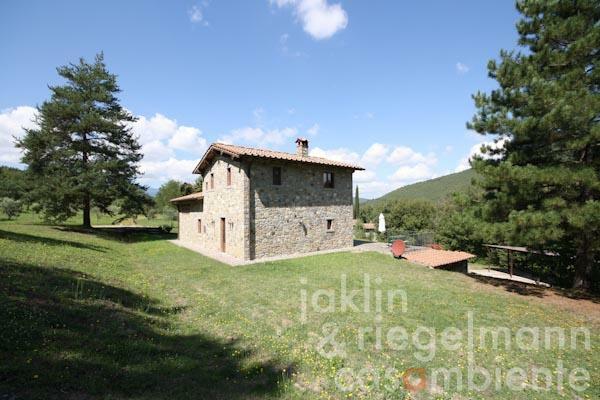 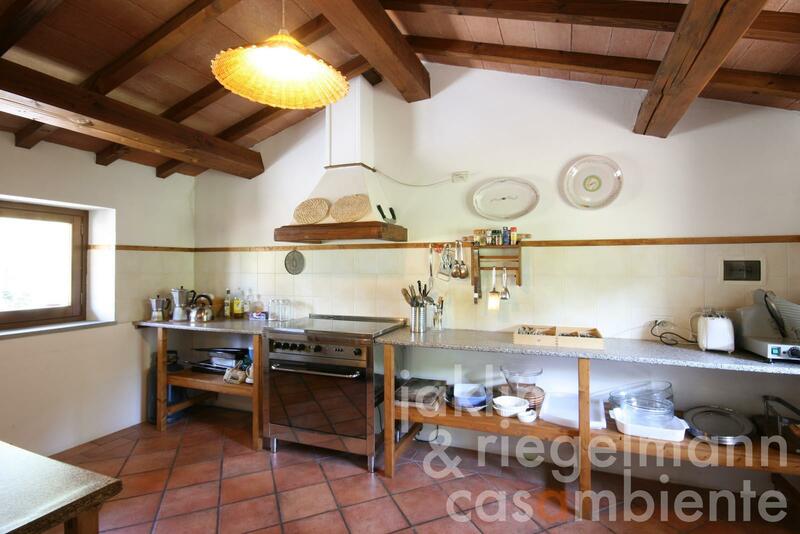 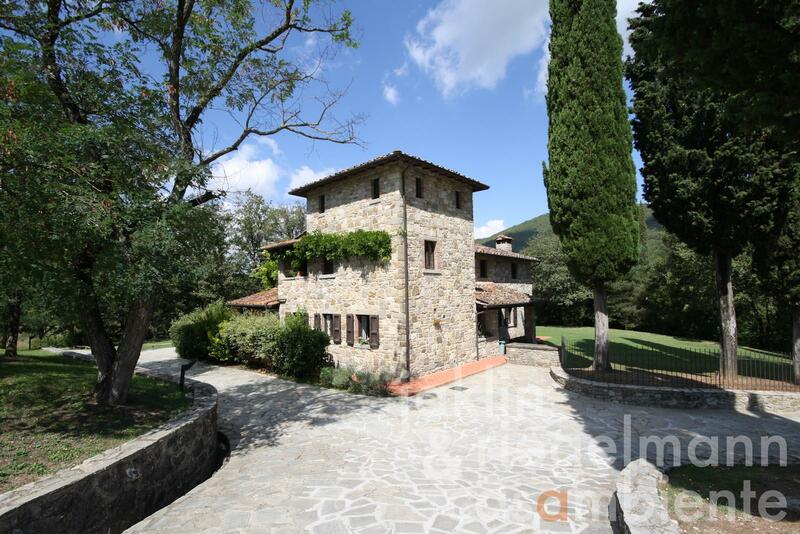 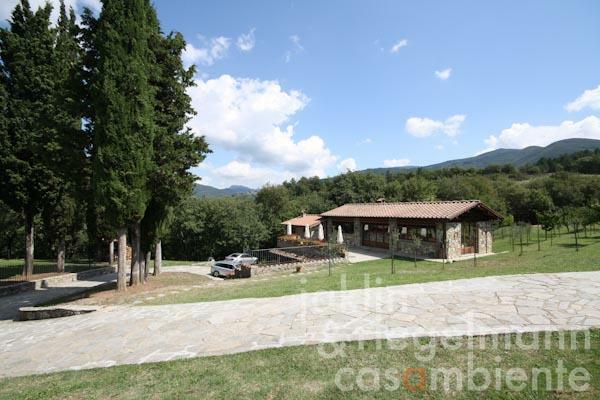 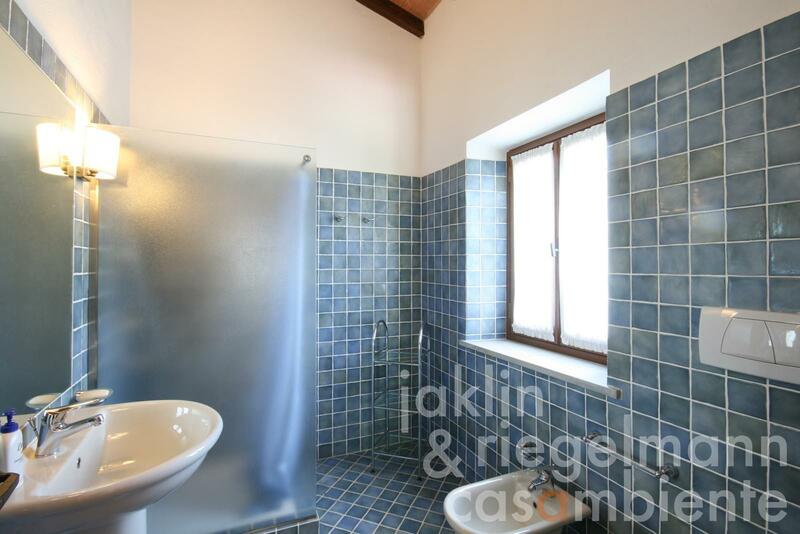 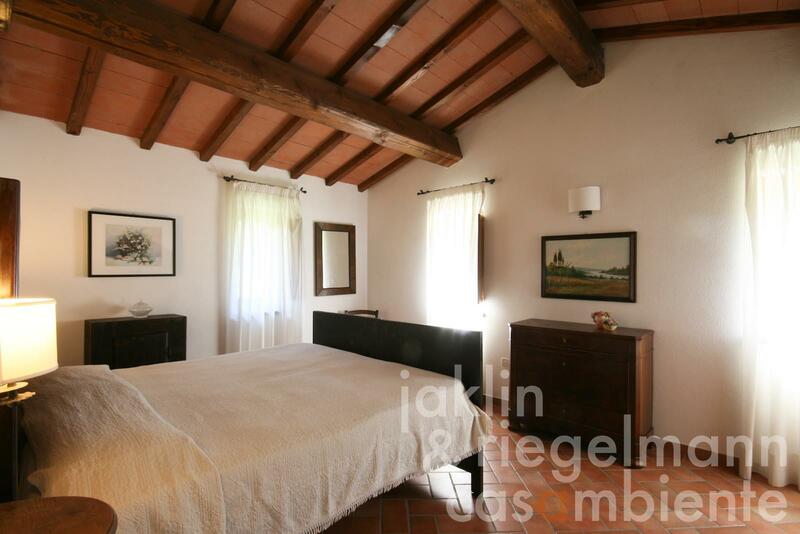 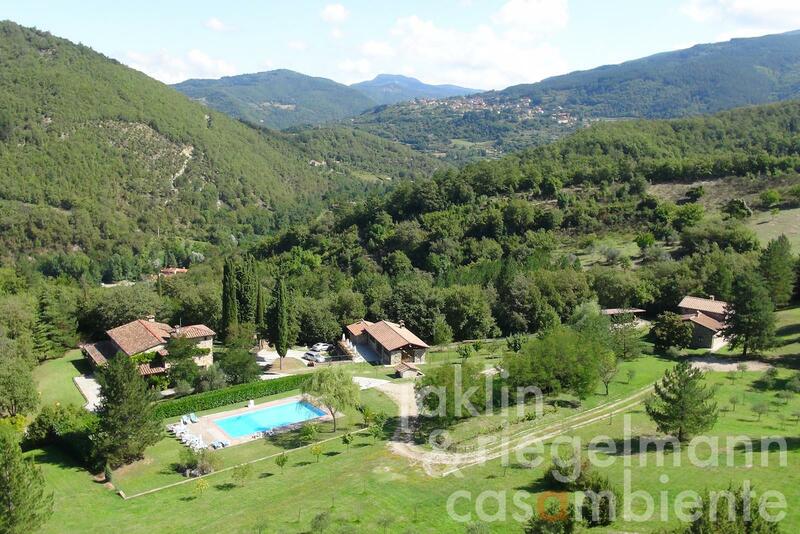 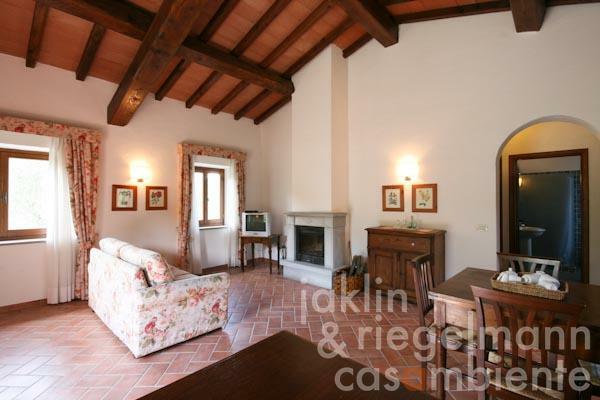 Very well-kept agriturismo property in sunny and calm location 450 m above sea level close to a hamlet in the lower Casentino valley in Tuscany for sale. 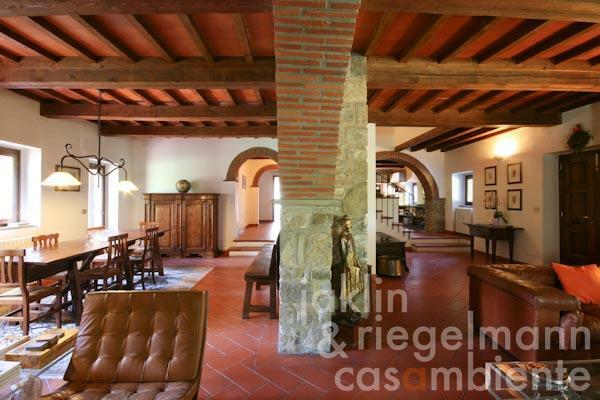 The property comprises three buildings, which are surrounded by a beautiful and fully-fenced garden (3 ha) with large pool (16 x 8 m), olive grove and fruit orchard. 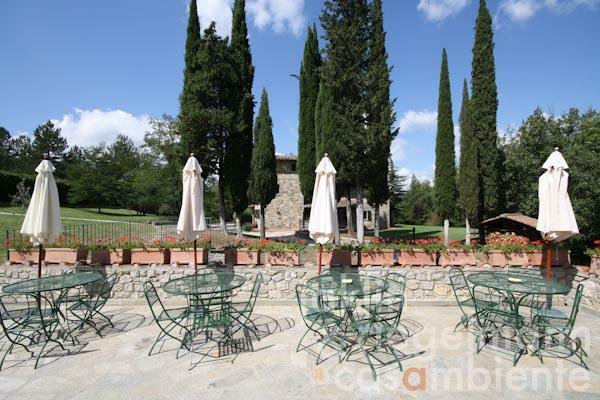 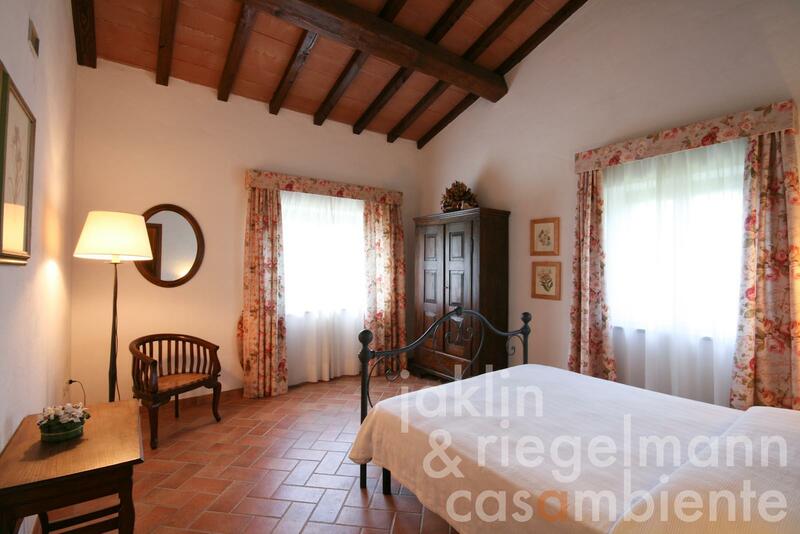 The agriturismo property offers approx. 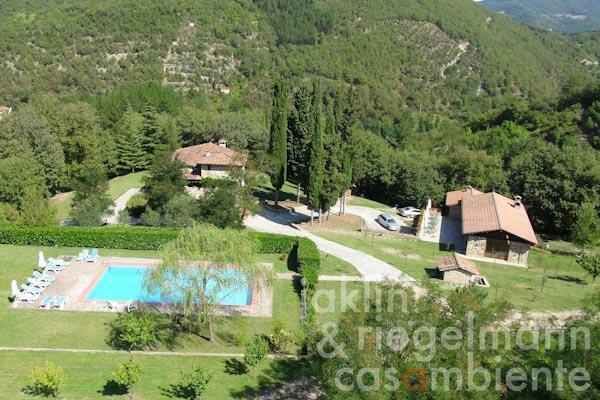 840 m² with 9 bedrooms, 10 bathrooms and 6 living rooms as well as common room with 130 m². 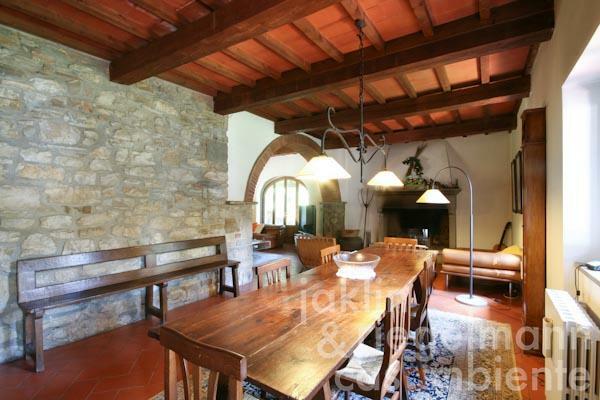 Each apartment has one or more open fireplaces in natural stone. 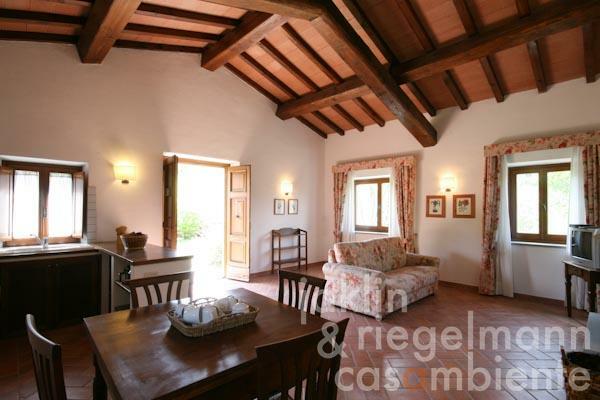 The main country house has its origins in the 18th century, was restored in 1996 and offers approx. 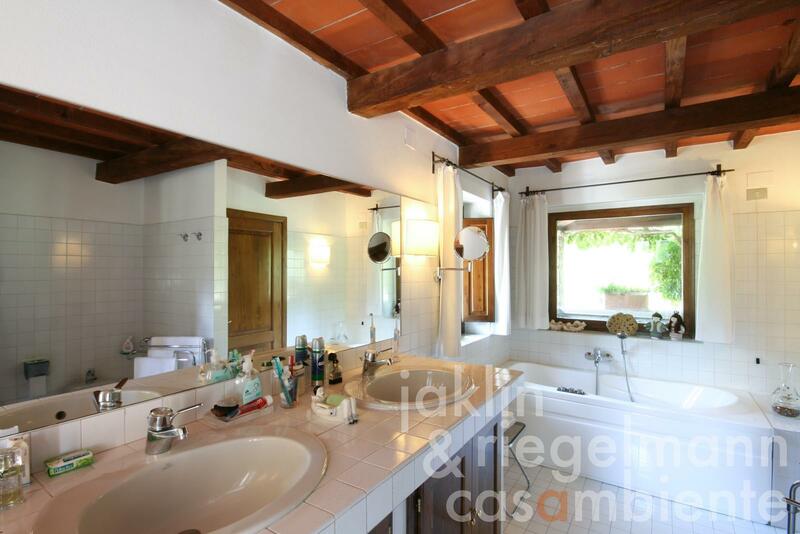 420 m² over two floors. The ground floor features a large living area with an antique fireplace, dining area, large eat-in kitchen with pantry, guest WC, studio and several covered outdoor areas around the building. 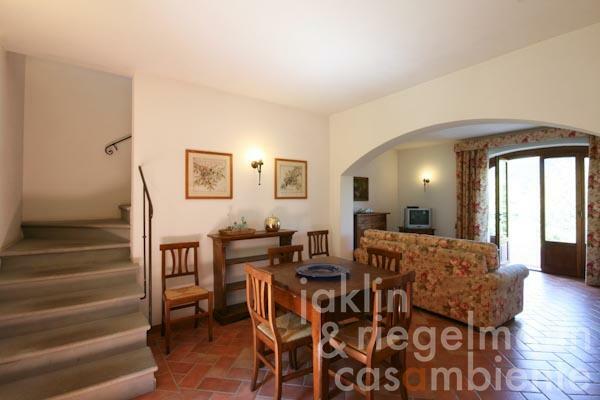 The first floor offers three large bedrooms with en-suite bathrooms and loggia as well as a wardrobe and bathroom for the fourth bedroom in the tower. 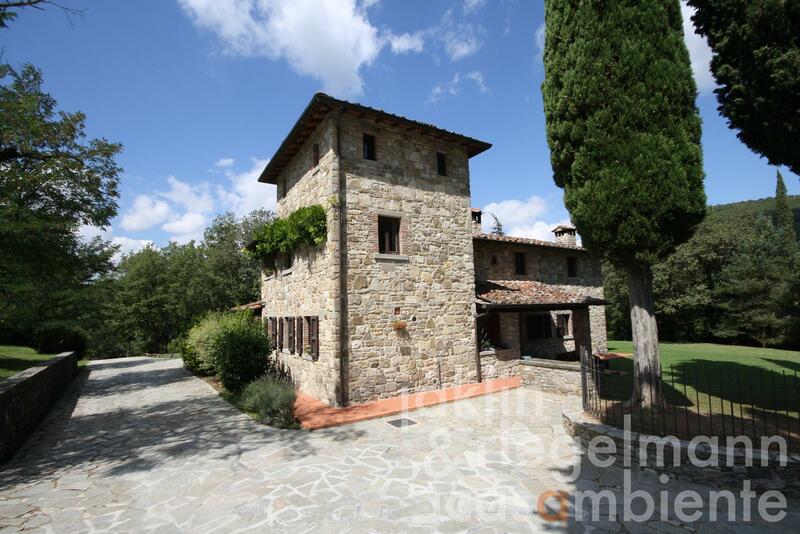 The tower has 8 windows with panoramic views in all directions. 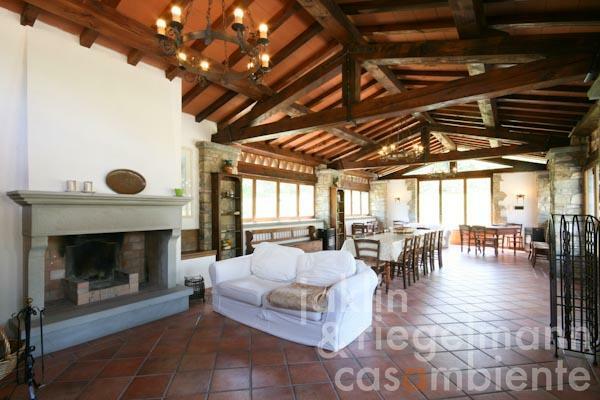 The second building is situated close to the main country house and composes of a living room with open fireplace and beautiful visible beams, common kitchen and guest bathroom. A large 60 m² terrace in front of the building is ideal for alfresco dining. The lower part of the building features three garages, cellar and a 90 m² apartment for employees. 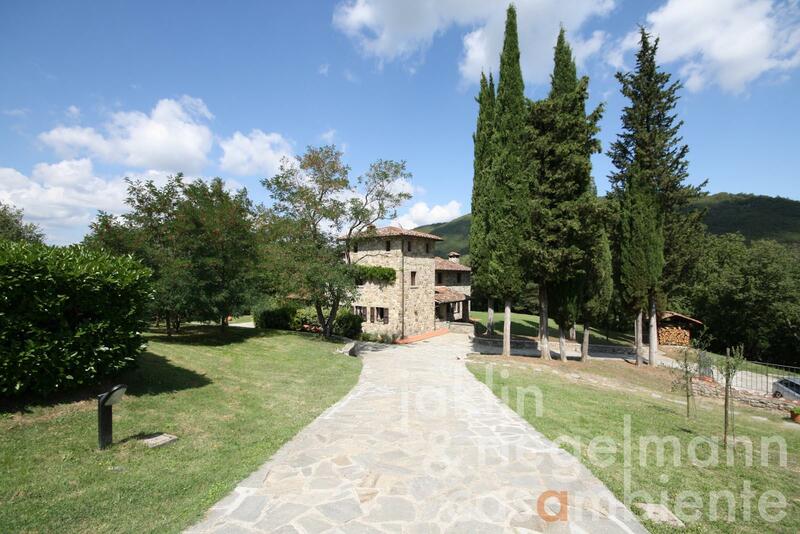 The third building is divided into two apartments, was newly built in 2004-2005 respecting the Tuscan building tradition - just like the first and third building. 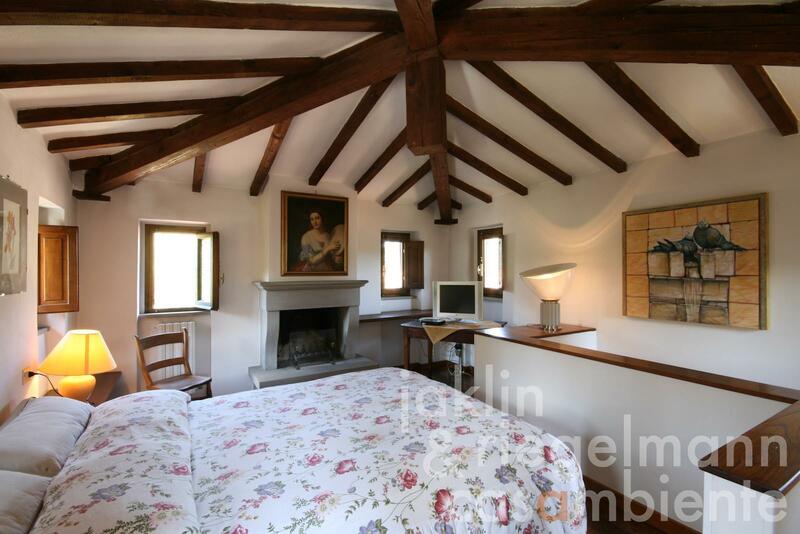 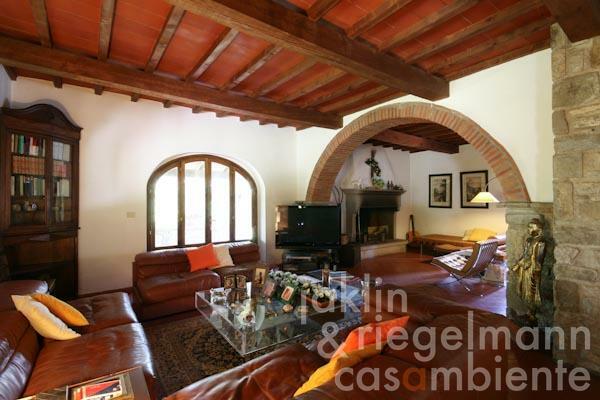 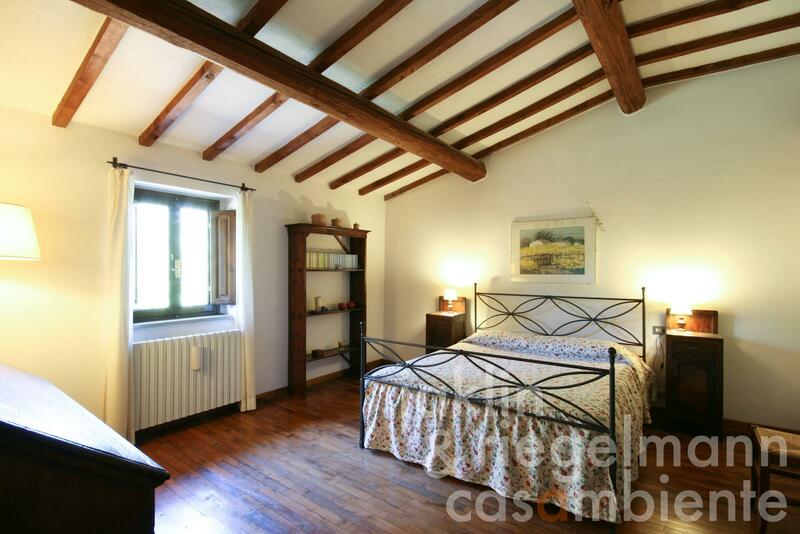 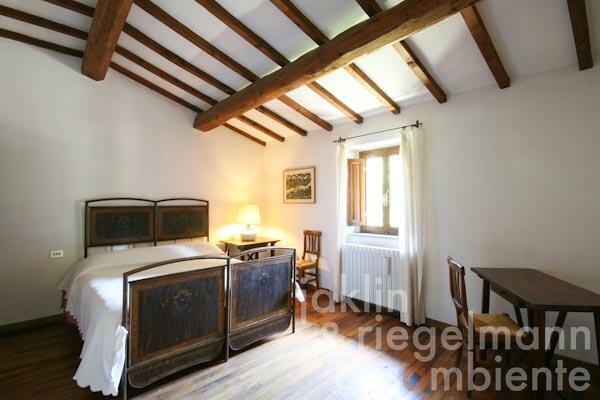 Here, the first apartment offers 70 m² with a living room with kitchenette and fireplace, bedroom, bathroom and loggia. 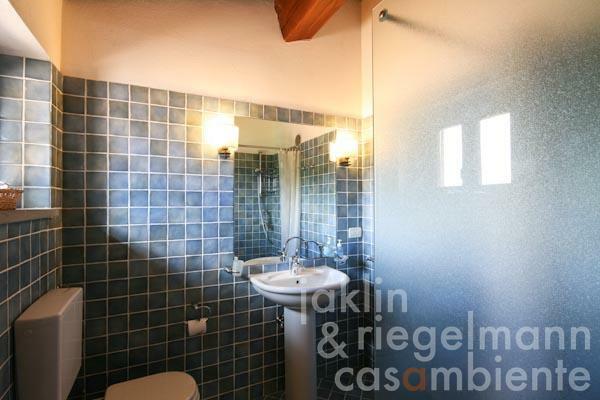 The second apartment with 100 m² stretches over two floors with a living room with kitchenette and guest WC on the ground floor and two bedrooms and bathroom on the first floor. 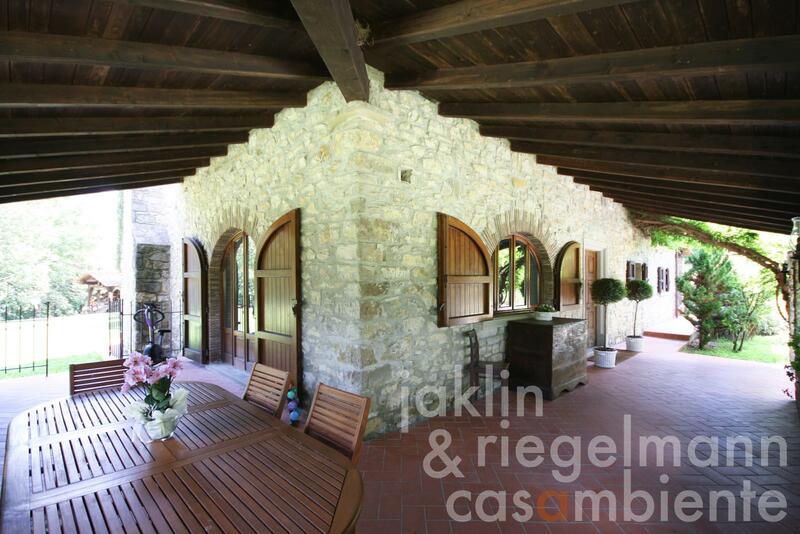 A cellar with 100 m² below the building is used as storage for farming equipment. 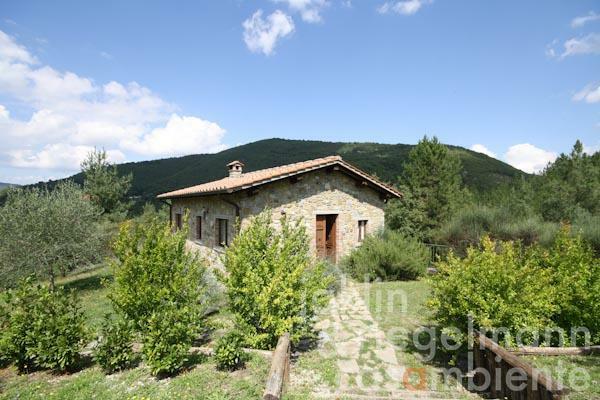 All buildings are connected by paved roads. 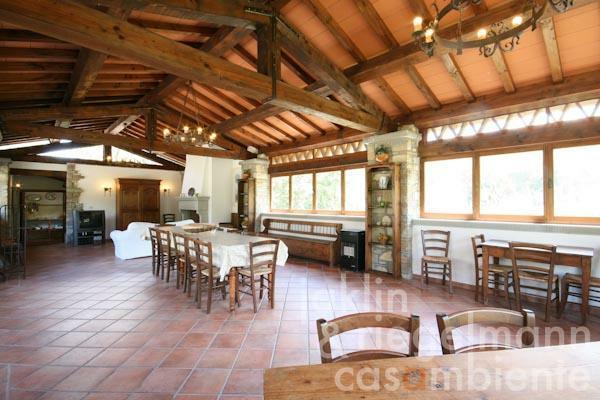 A portion of the property (approx. 7 ha) was subject to reforestation with tree varieties suitable for furniture production. All the estate's farming equipment is part of the sale. Italy, region Tuscany, province Arezzo, municipality Chiusi della Verna. 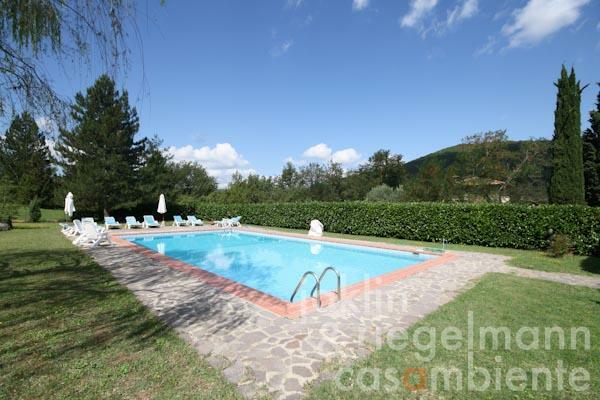 Electricity, own well water, central heating, fireplace, gas tank, telephone, broadband internet access, satellite-TV, automatic gate, irrigation system, swimming pool, garage, carport, private parking, terrace, olive grove, garden.